Give your playground the ultimate sun-protection with a high-quality shade sail. Children need the best sun-protection possible to prevent damage to the skin such as sunburn and the beginnings of skin cancer. Make your playground as safe and enjoyable as possible by providing a shaded, sheltered area that allows the children to enjoy the outdoors all year round in all weather conditions. 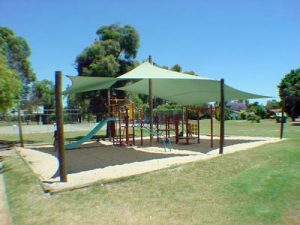 A high-quality shade sail can make a playground safe and more comfortable in extreme heat, as well as providing shelter from light rain for the winter months. Keep everyone happy and healthy with a range of expert-designed shade sails ranging in shapes and sizes to cater for different tastes and purposes. Safety comes first with shade sails offering maximum UV protection, and professional construction means that your sail can last up to 10 years. Children can play outside safely even in the most extreme heat with shade sails that offer up to 98% protection from harmful UV rays. UV inhibitors prevent any rays from penetrating the fabric, and UV stabilizers protect the quality of the shade sail itself by preventing sun damage and deterioration. Not only do shade sails offer maximum UV protection on hot days, but they also make the environment more comfortable, as breathable fabrics allow cool air to circulate beneath the sail, providing a cool and airy well-ventilated area that makes playtime on hot days far more pleasant and enjoyable. On the other hand, sometimes the rain prevents children from being able to enjoy their play equipment. With a high-quality shade sail they can play outside even in light rain showers, as water-resistant properties stop too much water from penetrating the fabric, allowing a drier and more comfortable environment. Different colours have different heat absorption properties, so depending on your primary concerns you can choose from a range of different coloured fabrics to keep your playground protected. No matter how big or small your playground is, and whether you want to cover the entire area or just a select section, we offer shade sails in all different sizes and dimensions so that you are sure to find exactly what you’re looking for. Choose from different shapes from square to triangle so that you can cover your playground exactly the way you want to. Once you’ve chosen the best shade sail for your playground, there comes the issue of installation. We offer two equally advisable options to make the job as hassle-free as possible: a professional and affordable installation service for all suburbs across Melbourne, and simple-to-use, effective do-it-yourself kits. We install high-quality shade sails in all suburbs across Melbourne, guaranteeing a professional construction for the maximum safety and protection. Working quickly and efficiently, we get the job done with expertise you can rely on, all for an affordable cost. To make things even better, we offer a free consultation, measure and quote. If you fancy yourself a bit of a handyman we make it simple for you to install your own shade sail, providing all the materials you need to complete a safe and stable construction. Everything you need including posts, fabric, structures, fixtures and fittings are packed in an easy-to-use DIY kit, complete with clear, comprehensive instructions to help make your experience as quick, stress-free and successful as possible. You’ll never believe how easy it can be to construct your own shade sail with professional results.Protect the children and create an enjoyable, comfortable play area with the right shade sail for your needs and desires.